I’ve given these muffins a spot in the weekly poll several times now, and week after week, they placed second. It’s probably a hint that I shouldn’t bake them, but yesterday I couldn’t help myself. I just love watching Nigella bake these and, as usual, I was craving something chocolaty! Well they tasted simply splendid! For a muffin, they had TONS of flavor! I know Nigella says she doesn’t like the muffins as much the day after, but I actually loved them even more: they were moister and the chocolate flavor became more intense. This recipe is a keeper! Rating: 4 out of 5. 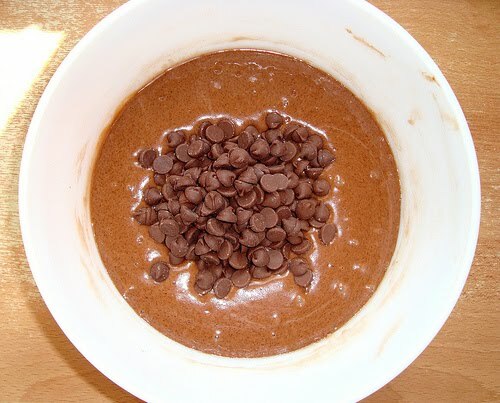 - Put the flour, baking powder, baking soda, cocoa, sugar, and ¾ cup of the chocolate chips into a large bowl. Pour all the liquid ingredients into a measuring jug. Mix the dry and wet ingredients together, remembering that a lumpy batter makes the best muffins. Spoon into the prepared muffin cases. Sprinkle the remaining ¼ cup chocolate chips on top and then bake for 20 minutes or until the muffins are dark, risen and springy. 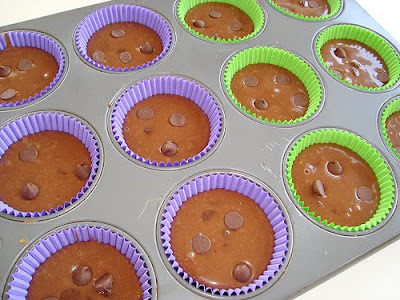 8 ounces of chocolate chips for a muffin is a bit much - but I wouldn't have it any other way! My new mantra is: "Chocolate everyday, keeps the doctor away!" 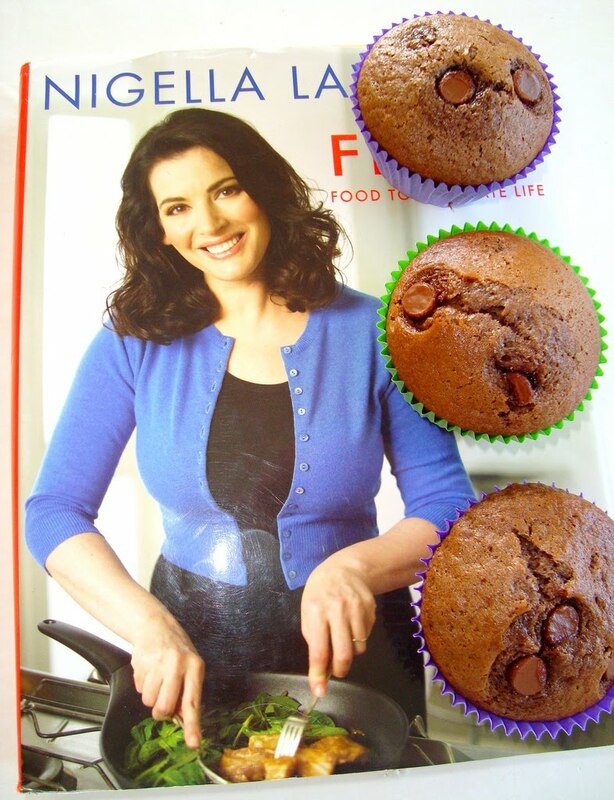 I guess it takes a lot of these muffins to maintain Nigella's fab figure. Oh, chocolate muffins! I love thy! Delicious and FUN looking with the little chips popping out like little dots. I love it. Oh, my goodness!!! 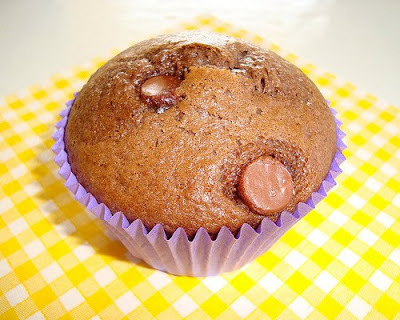 I love everything with chocolate and these muffins, oh, I have to make them!! Love Nigelia Lawson also. The sofa and one of her cookbooks is all I need for a cosy evening! I love these cupcakes! I made them on Valentine's day and they were sooo good! Is it bad I make mine from packet mix?....probably! You've inspired me to give them a go from scratch! Nigella is great! These look delish!! another recipe down for you!! what's next??? 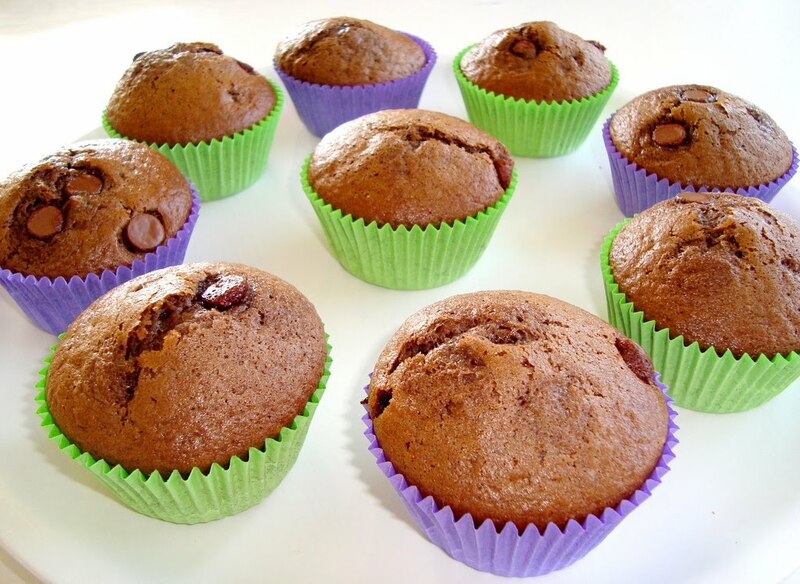 Oh wow these chocolate muffins look amazingly good :). To answer your question on my blog as well, I live in England,UK. We don't get anything like Froot Loops over here, all we have is Lucky Charms in some specialist stores and they cost £8 a box!! !Its ridiculous, I wish I had some way of getting them. Where are you from? Anything that's "double chocolate" is good by my standards! I made Martha Stewart's double chocolate cookies for a party last night (except with white choc chunks) and people went crazy. I guess double chocolate does that to you! I love Nigella. Those look AMAZING!